We act as credit brokers and we are not a lender. †Includes £500 Deposit Allowance Paid By Manufacturer. *Excess mileage charge of 7.5p per mile. If you exceed this annual mileage then excess mileage charges will be applied by the finance provider at the end of the agreement should you choose to return the vehicle. Finance subject to status. A guarantee may be required. Terms and conditions apply. Unless otherwise stated, metallic paint at extra cost. Library image for illustration purposes only. 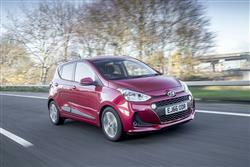 Hyundai is looking for its i10 city car to step up from being merely branded good value for money to being considered best in class - or thereabouts. With smarter styling, plenty of space inside and segment-leading standards of infotainment and safety, this much improved version is in with a genuine shot. Sometimes, the stars just align perfectly for a car manufacturer. Such was the case back in 2009 when two largely unrelated circumstances coincided. 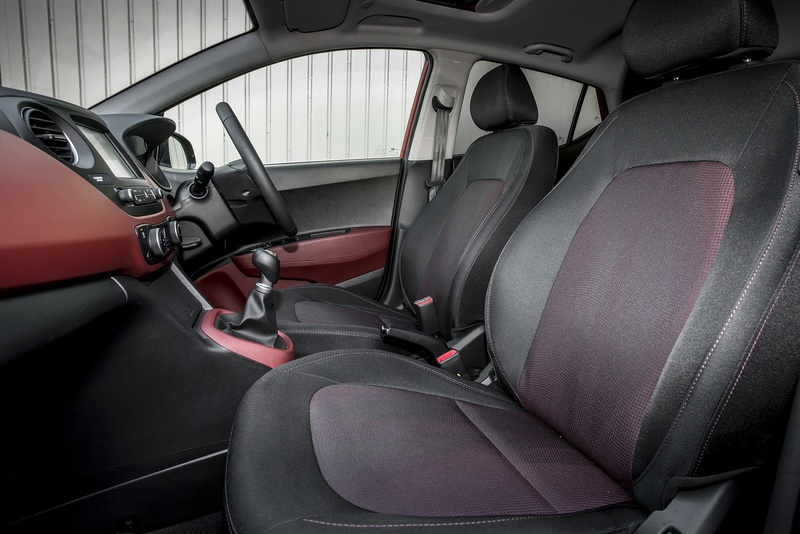 The introduction of the government's Scrappage Scheme saw a number of tired old cars being taken off our roads and resulted in a commensurate quantity of buyers with a modest sum of cash in their hands looking for something to buy. 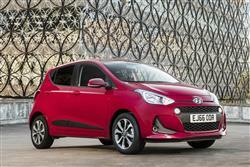 Fairly new onto the market and having just replaced the underwhelming Amica was the rather appealing Hyundai i10. 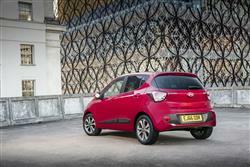 Sales skyrocketed and for a while, the i10 was the country's best selling car. It didn't last. While i10 sales continued quite strongly, the end of the Scrappage Scheme saw buyers return to their usual buying habits. Since then, Hyundai has tried hard to keep citycar buyers interested. It introduced a second generation i10 in 2014, a car designed to take account of the fact that competition in the citycar sector has become much stronger in recent years, with this model now having to contend with rivals of the quality of the Volkswagen up!, Skoda Citigo and SEAT Mii triplets. 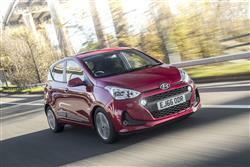 Since 2014, these contenders have been further upgraded and Hyundai has responded with a package of i10 range changes that include a smarter look and the addition of fresh segment-leading infotainment and safety technology. Nothing's changed beneath the bonnet of this facelifted car, so buyers still choose between two petrol engines, 1.0-litre and 1.2-litre in size, driving the front wheels through five-speed manual as standard or four-speed automatic gearboxes. The BlueDrive model, based on the 1.0-litre petrol variant, includes a number of features to reduce fuel consumption. 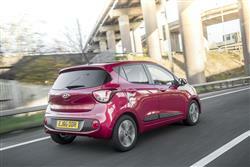 The 1.2-litre variant offers 87PS and is good for 62mph in 12.3s on the way to 106mph. The base 1.0-litre derivative offers 66PS and makes 62mph in 14.9s on the way to 96mph. There's still no diesel engine offered and it's probably a sound decision. Buyers of this type of car rarely rack up enough miles to make the incremental cost of buying a diesel work out versus the savings they'd see in fuel bills. The big draw for some (possibly older) buyers is the fact that the 1.2-litre variant can be specified with four-speed automatic transmission. Choose the auto for effortless city driving by all means, but bear in mind that it does make the car slower and thirstier than the 1.2-litre manual and hikes the carbon dioxide rating up quite significantly. Personally, we'd stick with three pedals and keep a bit of money in our pocket. If you happen to own the original version of this MK2 i10 model, then you'll notice the major change made to this facelifted version immediately, the so-called 'Cascading' front grille, apparently set to become a signature feature on future larger Hyundai models. Around this, there's a revised bumper design and smarter round LED daytime running lights. At the rear, this improved design is also characterised by an evolved bumper design, plus re-styled rear lights. Redesigned side mouldings round off the exterior aesthetic changes. Inside, it's as you were, apart from some minor material changes. 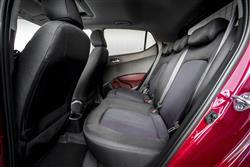 Still, not much needed altering; after all, the i10 offers best-in-class legroom and cargo capacity. There's certainly more room in the back than you might expect. Once you've entered through the wide-opening doors, you'll find a very decent level of roominess for this class of car, providing you stick with the carriage of just a couple of adults. True, the sharply rising window line might not prove popular with very small children, but they won't complain about the legroom on offer. Even with a couple of six-footers installed at the rear, front seat occupants shouldn't have to compromise space to accommodate them. 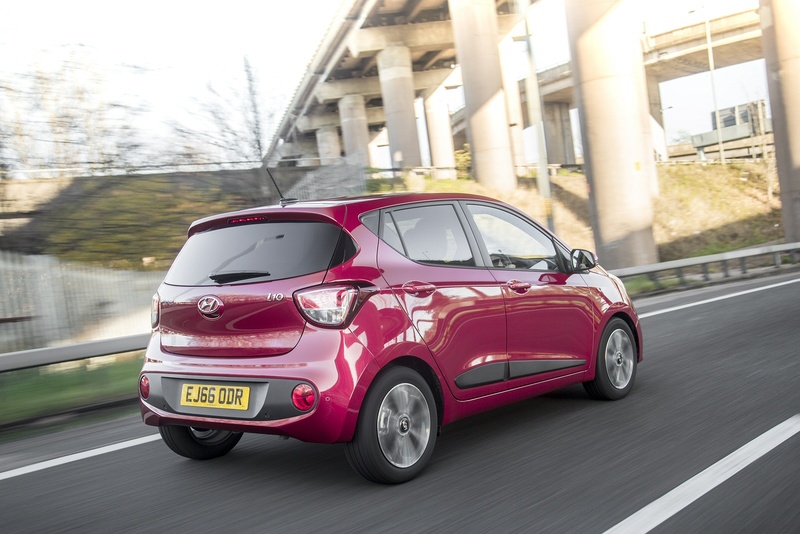 Boot capacity is a supermini-style 252-litres with all seats in place. By contrast, a Skoda Citigo offers 251-litres, so Hyundai just squeaks in above the class benchmark. There are four main trim levels - 'S', 'SE', 'Premium' and 'Premium SE'. Prices are much as before, so you're looking at figures that start at just over £9,000, rising up to around £13,500 for the single five-door bodystyle on offer. Those are competitive figures, even though the i10 is no longer a model judged on the amount of metal you get for your money. It's not looking to be the cheapest in its sector. This is a contender that stands toe to toe with the best in class and is priced accordingly. 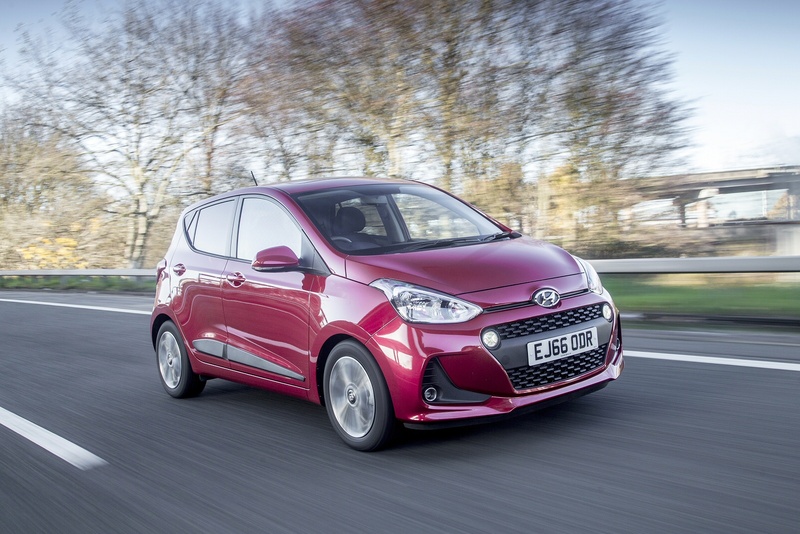 It's almost exactly on a par with the five-door versions of Skoda's Citigo, but this being Hyundai, the car offers a lot of standard equipment for the price point. Base trim levels give you, well, the basics, but if you can stretch to the plushest variants, then you'll benefits from the upgrades made to infotainment and safety technology with this facelifted design. 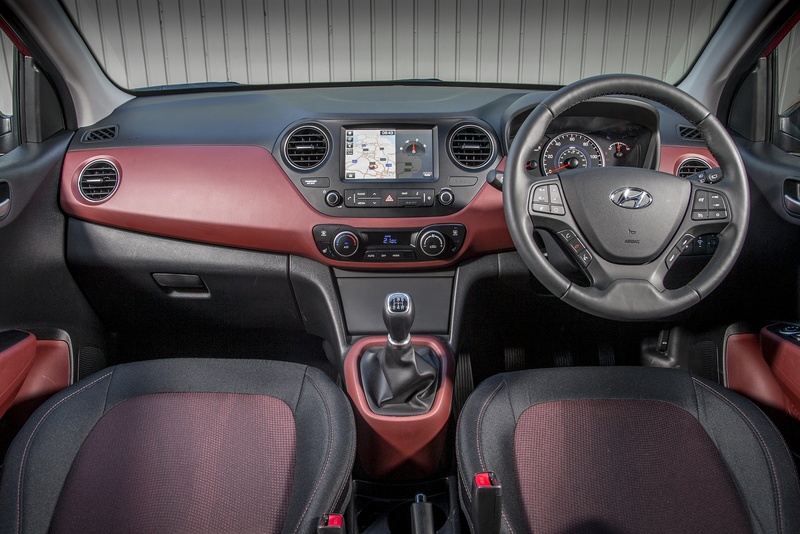 Buyers at this end of the range now get a 7-inch colour touchscreen with Apple CarPlay and Android Auto smartphone connectivity, plus a Navigation system incorporating Hyundai's LIVE services. These give you real time traffic information, plus local weather reports, speed camera placement locations and points of interest searches. Safety-wise, upper-spec models can now be ordered with a Front Collison Warning System that automatically brakes to avoid accidents. With most variants, there's also the option of a Lane Departure Warning System. 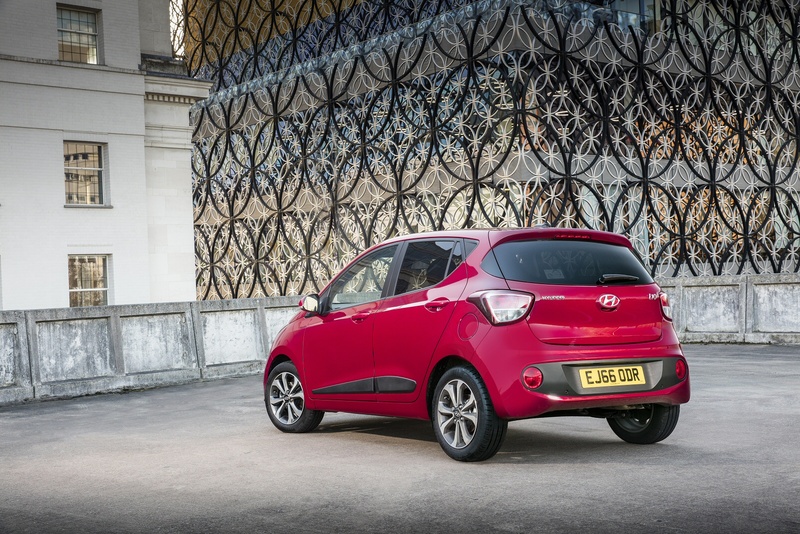 If you want the sub-100g/km of emissions that will bring you a free annual road tax disc, you'll have to buy your i10 in 'SE Blue' 1.0-litre manual form with mid-range 'SE' trim (and, for some reason, only four seat belts). That variant delivers 93g/km of CO2 and around 65mpg on the combined cycle. Otherwise, the 66PS 1.0-litre petrol engine in standard guise puts out 108g/km of CO2 and manages 60.1mpg. Go for the petrol 1.2-litre variant and you're looking at 57.6mpg and 114g/km of CO2 - unless you opt for the automatic version in which case the figures rise substantially to 45.6mpg and 142g/km. Insurance groupings stand at 1A for the 1.0-litre model and 4A for the 1.2-litre car. Residual values are very class-competitive too and servicing costs are down thanks to features like a maintenance-free long-life timing chain. Combined those factors with the frugal fuel economy and the tax savings you'll make in ownership and you'll emerge, according to industry experts CAP, with a class-leading pence per mile running cost figure of just 29p, a couple of pence better than a Volkswagen up! In other words, the best citycars can also be the cheapest to run. A five-year unlimited mileage warranty is another big draw, especially when the Volkswagen/Skoda/SEAT triplets only offer a three year and 60,000 mile deal. 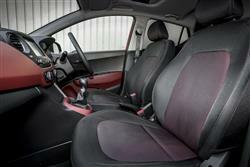 If you�re looking for a new Hyundai i10 1.0 S 5dr Petrol Hatchback for sale, you�ve come to the right place. 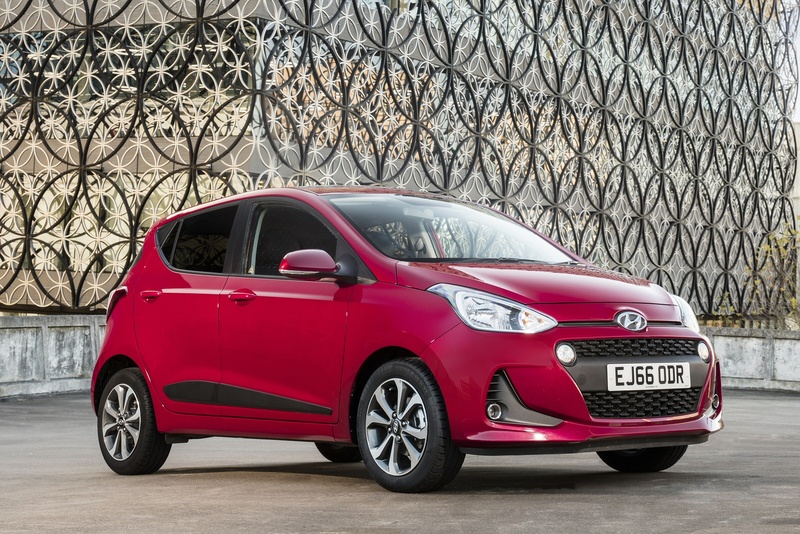 At Bristol Street Motors we don�t just have the best Hyundai i10 1.0 S 5dr Petrol Hatchback deals, we also offer friendly advice and help with all your enquiries to ensure your buying experience is a happy experience.